This post originally appeared at The Black Giraffe blog on May 13, 2018. Many books about cutting-edge, transformational ministries are told after the fact. A new opportunity arose, the Holy Spirit nudged a few faithful, gifted leaders, and, looking back, the whole enterprise seems almost inevitable. 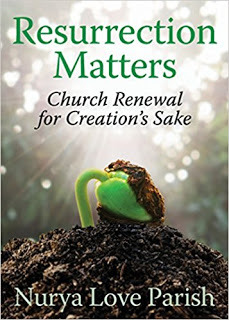 Resurrection Matters: Church Renewal for Creation’s Sake by Nurya Love Parish takes a very different approach. Nurya tells her story of starting a farm-based ministry while still in its early phase. Instead of three easy steps to replicate this ministry in your own context, we are blessed by the courageous account of someone struggling to answer her call in a confusing time for the church and critical time for the environment. How God has led her smack dab into the middle of the fledgling Christian food movement is both challenging and inspirational. Throughout this book, we are introduced to Nurya’s deepest passions. Her central passion is her faith in the resurrection of Jesus Christ. Flowing out of that faith are her dedication to the renewal of God’s church and the stewardship of God’s creation. In Resurrection Matters, we journey with Nurya through the personal stories and the facts and figures that led her to taking a huge risk with her family’s home and savings to start a farm ministry. Along the way we learn about the infinity loop of organizational renewal, the contemporary church’s “rummage sale”, the modern history of Christian farm ministry, and why millennials seem more interested in organic farming than churches. Most importantly, we share a Christian leader’s struggles as she finds the necessary wisdom and courage to begin a non-traditional ministry that is beginning to make a difference in the church and the environment. Resurrection Matters’s engaging style makes for an easy and enjoyable read. The book contains appendices with a study guide; planning processes for households, congregations, and judicatories; information on community supported agriculture; and lists of resources for further study. I highly recommend this book to those interested in how the church might engage creation care, as well as to anyone feeling like God may be calling them to start something new. You can order Resurrection Matters from church publishing or Amazon. The Rev. Dr. Adam Trambley is rector of St. John’s, Sharon. This entry was posted in discipleship, Ministries and tagged book review, books, Resurrection Matters, Rev. Adam Trambley. Bookmark the permalink.